Ok! Jammed out the hand study in not too much time... well, scrap that, it took forever, but here it is. Can you guess which of the panels is the first attempts and which is the last? Guess correctly and you'll get the genuine, ultra-uber No-Prize! Exciting I know. Now I think I've got a decent grasp of the hands at various angles and have a feel for how they move and work. Hopefully my work here will help others learning the very difficult process of drawing hands. For a general reference, I didn't use any single method for making the hands... Sometimes I used block+stick construction (as you can see in a few of the hands), sometimes I used circle+tube construction, and a few times I just freehanded it (mostly towards the end). Block+Stick and Circle+Tube pre-construction methods are really helpful for getting a handle on how things work, but after I was comfortable enough with it and started just freehanding it, I think freehand sometimes turns out better... or at least more stylish. Block building tends to turn out just as you'd expect: blocky. Thank you so much for posting this! It really helped me! This is incredibly helpful. Thank you very much! Thanks man, this reference really helped out. I'll tag you when I post the illustration I'm working on. It's a very good study! Congrats! This is extremely helpful, thanks so much for posting! Wow! really good! 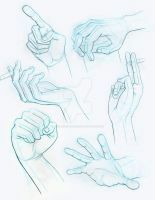 this is helping for everyone wat to draw hands! This is awesome. Did you have someone hand model for you ? tons of help ,thank you. Thank you im using part of this for myself to practice. very inspiring. I hate hands but then again i dont practice nearly as much as I should...Where did u get the references out of curiosity? nice work. this is amazing!!! This looks nice to me. This is -awesome- and definitely useful to random joe shmo who need references in front of them! I've never seen a hand study with so many poses! wow amazing. This had to take forever. Wow! This is awesome! Thnks for putting it up for others to see! I'm using this quit often. They look like they originated from Disney's Tarzan and Avatar. Nice hands... If you don't mind my saying so, I think perhaps you should keep doing this kind of stuff; more conceptual stuff and less finished works. Might prove beneficial to you. And good idea about studies/tutorials equating to hits... Never thought of that. Did you happen to use a lot of key words or put it in an unusually popular category?